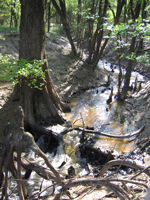 A creek in East Texas, flowing to the Neches River. -- water that is present for part or all of the year, at or above the surface, or within the root zone. -- soil characteristics that differ from surrounding uplands. -- wetlands will contain plants that are adapted to the presence of water, and generally lack plants that are intolerant of wet conditions.